I was introduced to the Sufferfest by a good friend about 18 months ago and if you have to do indoor bike training (like most of us) this is the product for you. The first couple I did were Downward Spiral and Revolver. Those worked well for me but about 8 months later I got an advance copy of two workouts that have become my favorite trainer workouts (if you can even say that about a Sufferfest workout). They were A Very Dark Place and Hell Hath No Fury. These have become my all time favorites, and also a little bit of a crutch when I am on my trainer. So I had a hold of Quadrathon‘s computer and had a chance to do one of the newer ones, There Is No Try. What was also really cool about this workout was it used the footage to Thibaut Pinot as he won a stage in the Tour de France from 2012. I actually watched this stage and it was really cool to workout while he won. It was an awesome stage to watch and even better to ride with! Overall the work out rocked! It will be in my A-rotation of trainer rides now that week day rides can only happen on the trainer. They made a couple nice enhancements to this video; they have a better graphic which reminds you what your perceived exertion rate and cadence should be and they added a count down to show you when the interval will be over. The video has all the elements that make the Sufferfest the best series of indoor training videos; great music, hilarious taunting (as well as encouragement from Yoda himself), and a well designed workout that makes excellent use of your time on a trainer. It is well worth the $13.99. 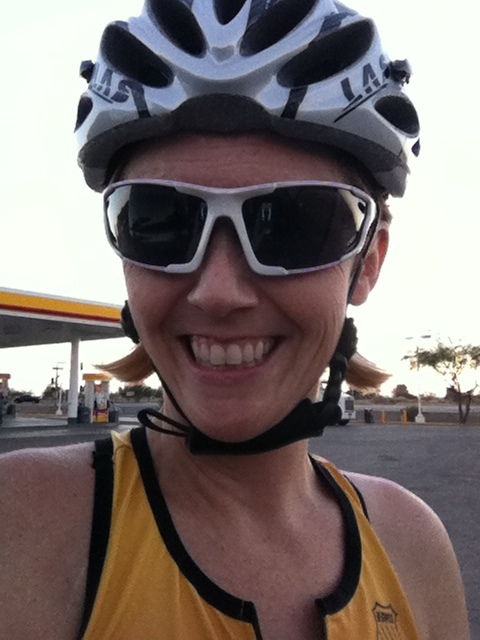 Ever since Ironman St. George in May I have essentially had no training plan. None of the races I have done since then had really required a strict plan (except for the 10K) and I have felt like I am still just trying to get my running back. I am just under 20 weeks away from the Boston Marathon so I better figure out how I am going to train for that race soon; training starts the week of Christmas! I have really been worrying about how I was going to fit everything in and this seem like it might be the solution! 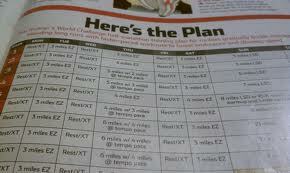 I will test out this schedule for the next couple weeks and then the plan starts 12/24/2012! I needed a 70.3 distance race in my prep for Challenge Penticton and since I have a few big races this year, this one would have to be on the less expensive side. The perfect solution that came to mind is Barb’s Race. 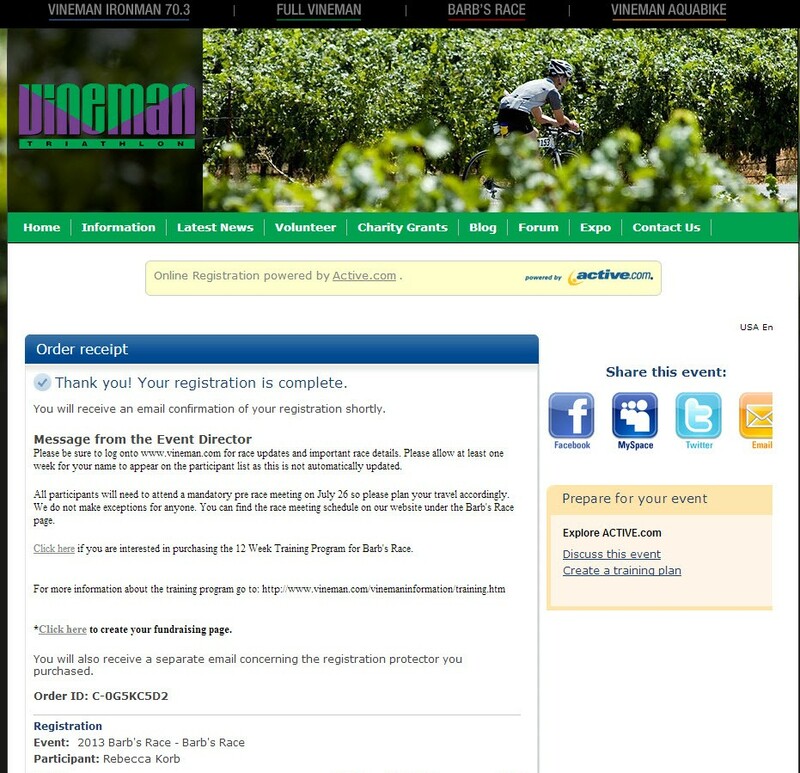 It is a 70.3 Triathlon on the same course at the Ironamn 70.3 Vineman race. But this race is two weeks later, only for women, and is capped at 450 entrants. It is the same weekend as the Full 140.6 Vineman race so the area will still be very busy but since none of the races that weekend are branded Ironman, I expect it to be a little bit more low-key. 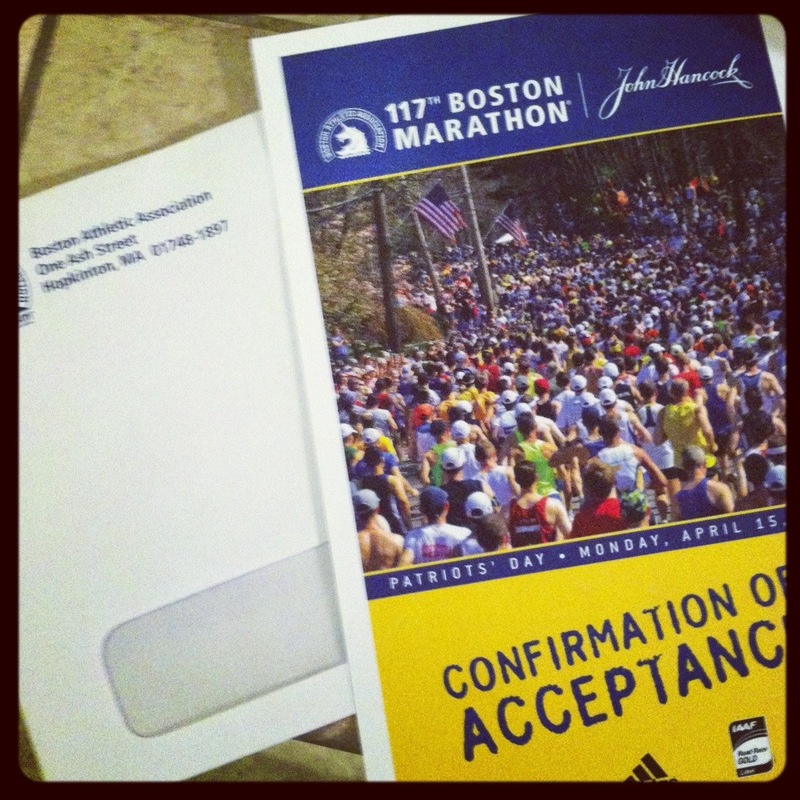 The big difference for this race is I have to do some fund raising; something I have never done before. I am really excited for the race! The plan is to make it a quick trip (only two nights); and since I have done the course twice it will be easy to make a quick race out of it. No need to get up early or stay after. Please click here if you would like to contribute. If you have ever done a big race you understand the importance of having a “Sherpa” with you to assist you. You need help with a variety of things including drop offs, pick ups, photo taking, social media updates, etc… After my Ironman, my Sherpa had to help me get in to the shower because I couldn’t get my kit off! 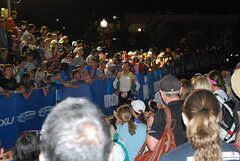 I have been lucky to have people in my life Sherpa for me over the years so I was thrilled to Sherpa for someone special who was doing their first Ironman. I had the best day EVAH!!!! It was one of the most inspiring things to be a part of. 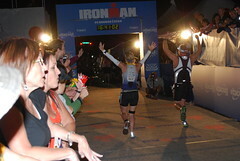 If you have never watched an Ironman from start to finish in person, you really should. 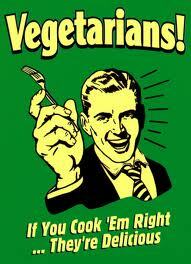 It might just change your life! So below are some words of advice for the super important Sherpa. Know the course. I became very familiar with the course prior to the race and that, coupled with my iPhone, helped me navigate my way around very effectively. I easily saw my athlete 13 times throughout the day. Make people smile. I did everything I could to make the athletes smile while they were racing. 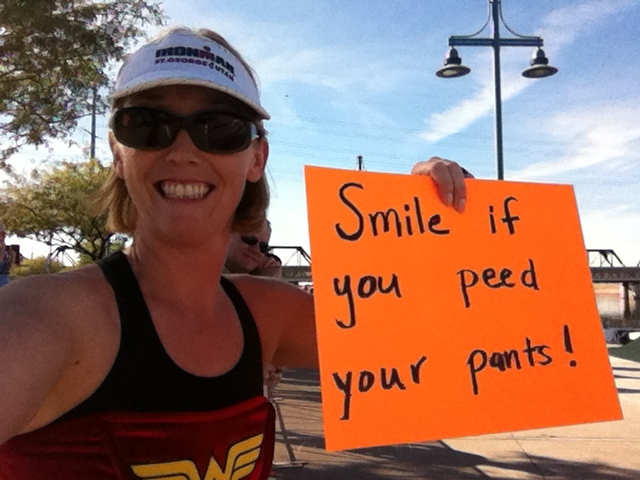 I made funny signs, “Smile if you peed your pants” was a big hit; and I wore a WonderWoman costume, people enjoyed that! Cheer cheer cheer!!! I made it a point to read people’s names off their bibs and they all really seemed to like it. I know I helps get me through a race when someone calls out my name. I also gave people who I saw a bunch nicknames, “LA Tri”, “Purple matchey matchey”, Pink Socks”, anything that stood out worked. Chalk the course. 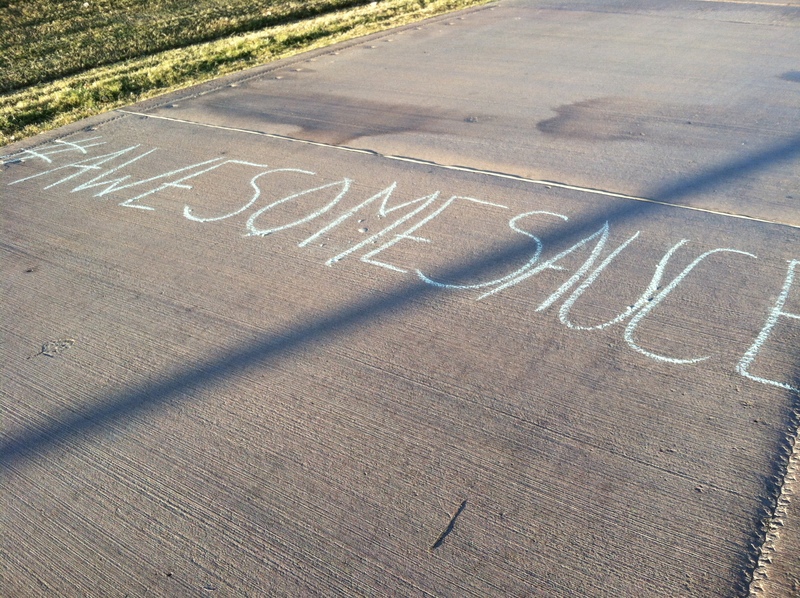 I ran around during the swim and left messages on the course with sidewalk chalk. Some were funny, some were motivational, and many were inside jokes that only my athlete would get. I took pictures of many of them and it was fun to ask if he had seen them on the course. Take lots of pictures. It does get in the way of cheering but the pictures become treasured after the race and then everyone else can see what the experience was like. Update social media. We are both very active on Twitter and a few other sites so I updated all of them all day long. When the race was over, he was able to see my “journaling” of the day as well as all the people that were cheering him on online thorough the day. If you have a Garmin or sport tracking watch use it for the day. I think I walked close to 10 miles that day! And if you are at an Ironman, you have to go back for the last 30 minutes of the race. That is the most amazing time of the race. If you don’t cry in the chute during that time you have no soul! 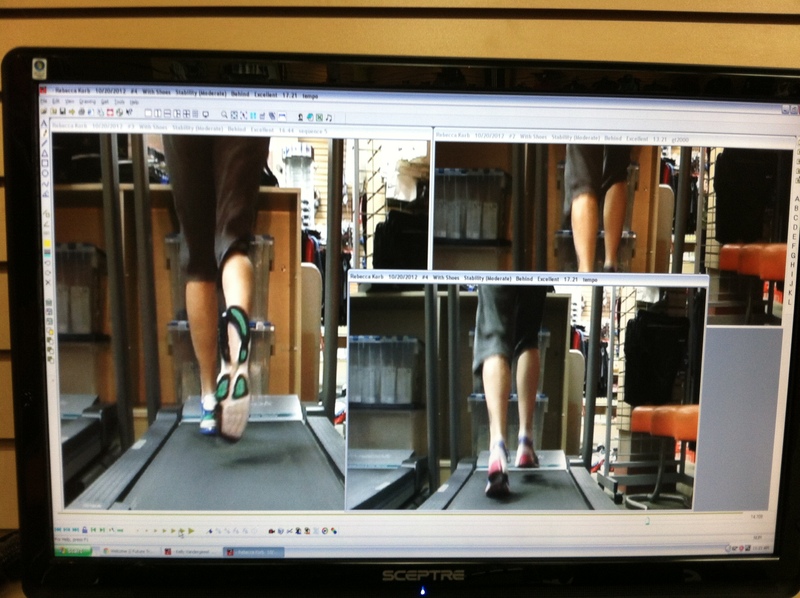 Click here for Quadrathon’s race report.